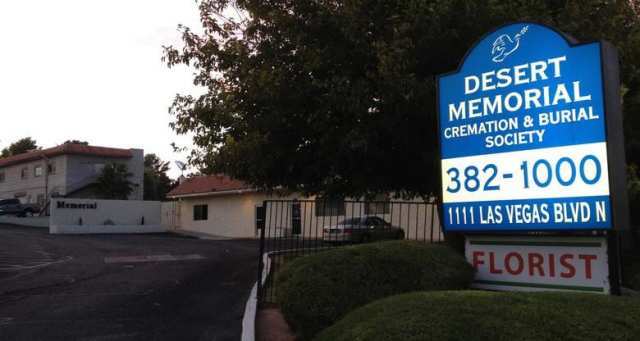 I had my mother cremated at Desert Crematory and would recommend their services. When making the details for her there was no pressure to buy things we didn't need or want. We hopefully will not have to use their services anytime soon but will if the need calls for. When my father died we used Desert Memorial to take care of his funeral arrangements. The staff was caring and helpful in answering all of our questions. We had Dad cremated and then shipped to Texas for burial. Desert Memorial took care of all the details in a timely and professional manner. They made this whole experience a lot simpler than I expected. Thank You Desert Memorial. My Mother died March 6th after an accident the day before. Our family used Desert Memorial for the cremation and services. I would like to thank everyone involved from the doctors at Mountain View Hospital when this happened to the staff at Desert Memorial to the people at the Veterans Cemetery in Boulder City. Desert Memorial made the best of a bad situation and I thank them for helping our family in many different ways. Also, the ground crew at the cemetery was incredible. After the service they had friends and family place handfuls of dirt and flowers into the burial site which was very important to those who attended. My parents made funeral plans with desert memorial years ago. My dad died and when we called to see what we had to do we were told everything was on file and asked if there were any changes that we might want. His wishes were to be cremated and that is what took place. We did not have to do anything until they called and told us the urn was ready to be picked up. The whole process was very easy. After going thru this I'm going to set up the same thing for my wife and myself. When you're tired, sad, angry & mourning, the last thing you feel like doing is a Yelp review. Now that a month has gone by, I want to recognize the wonderful staff at Desert Memorial for their kindness, thoughtfulness, compassion and thoroughness. Kristen is amazing. She provided excellent follow through and wanted us to be happy. You can tell she really cares about her job. Even though this sounds odd, my nephew looked amazing in the casket. It really helped to provide closure for our family. The front office staff was so kind and comforting. Additionally, many thanks to the funeral attendants Kunta & Mr Williams. You all deserve to be recognized for your dedication and service. It can't be an easy job. to us all. Thank You! for allowing us to do so on such short notice.